Here is the list of Best Free BPG Viewer Software for Windows. These free software will help you view BPG image easily. BPG is an image format that is considered as a replacement for JPEG and is better than JPEG in terms of quality and file size. 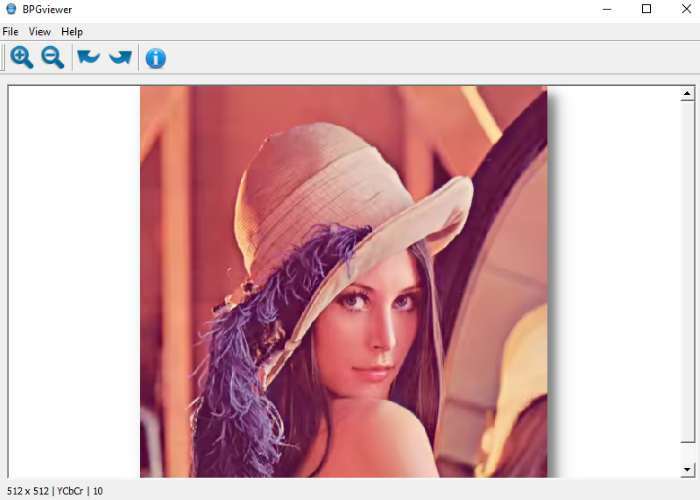 This image format is gaining popularity, but for now there are not many image editors and viewers which support BPG format, so this list of free BPG image viewer and some image editors will help you view and edit a BPG image. Some of these BPG viewers will simply let you view a BPG image with simple Rotate and Zoom tools, while some of these will let you save as BPG or other supported format. Some of these free software are advanced and support editing tools, so that you can edit them. You can even open multiple BPG files at a time with some of them. You can use some of these as BPG converter software and can convert BPG format to other supported formats and vice-versa with them. Just for viewing a BPG file, I prefer BPGviewer in this list, as it let me get a simple view of a BPG image on my PC. To view a BPG file along with editing it, I would choose XnView, as it supports numerous viewing and editing tools and even features option to save and convert BPG format. You can also check out the list of Best Free Image Viewer, EXIF Viewer, and EML Viewer Software. BPGviewer is a free BPG Viewer software, which you can use to view BPG file easily. This freeware is very simple and just lets you load and view a BPG file. It has simple and attractive interface with a small Menu bar comprising: File and View options. These Menu options feature a few image viewing tools that you can use to view a BPG file. To open a BPG file in this free viewer software, you can just click on Open option under File menu, browse an image with BPG format extension (.bpg) and select it to open. You can also simply choose Drag and Drop a BPG file on the interface to open it. You can use supported viewing tools like: Zoom tool, to zoom in and zoom out the image or Rotate tool, to rotate the BPG image clockwise or anticlockwise. This freeware also displays shortcut buttons for these viewing tools on the interface. You can also use the Scroll bar, to scroll up or down, if the BPG file is larger than interface size or zoomed in. There is one extra feature that this free viewer supports, which is ‘Info‘. You can view the information of a BPG file with this option in terms of: Bit depth, Color space, Format, Height, Width and limited range. Some of this information is also displayed at bottom of the interface by default. I will say, BPGviewer is one good software that you can surely use to view your BPG files. Simple BPG image viewer is yet another BPG viewer software, which is dedicated to BPG file viewing purpose only. This freeware only supports BPG format and you can use it to view different BPG files one at a time. 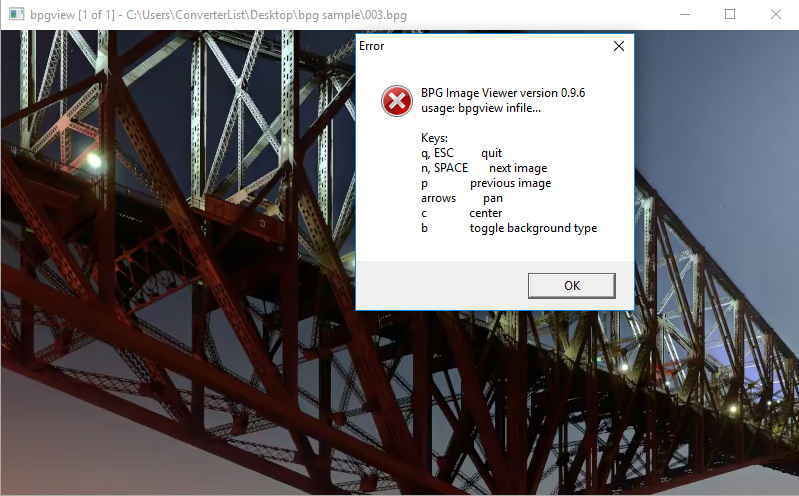 Although being a simple dedicated BPG viewer software, you might get confused a little while using it, as its interface doesn’t displays any option or tool to view an image. The interface of this free viewer opens up like a blank white area with a small logo on top and a command line: Press ctrl+O to open BPG file. You have to follow and press this key combination to open a BPG image in it. Del – Delete current files. Apart from these, this free BPG Viewer also displays file size and quality percentage info at the top of the interface. Although this freeware lets you save a BPG file as PNG, I think that it will be better if you look for some other good BPG Viewer software. 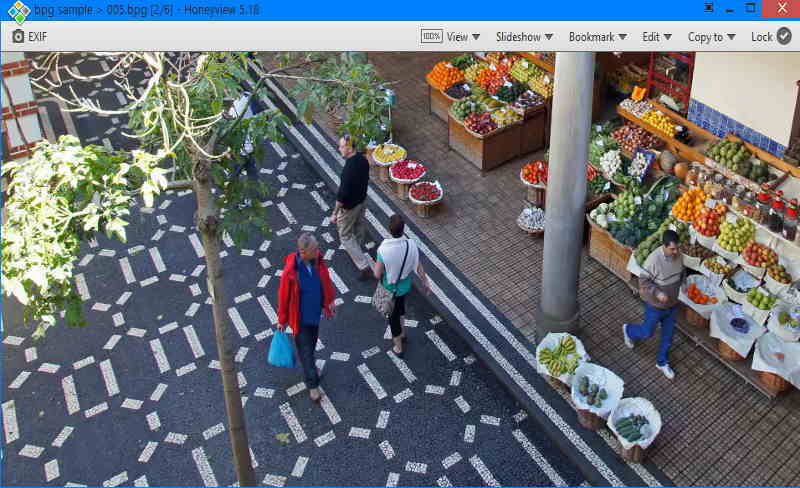 Honeyview is a free image viewer that you can use as a BPG Viewer quite well. You can use this free viewer software, to view BPG files along with their EXIF information. It lets you add multiple BPG images from a folder and you can view them individually one after another. You can also play a slideshow of BPG images with this freeware. It has a simple and interactive interface with numerous features, namely: View, Slideshow, Bookmark, Edit, and Copy to. With these options, you can set image size to display, play slideshow, bookmark images, rotate and resize image in bulk. You can also lock your image with Lock option. Its support for various editing tools let you apply different effects like: Reverse Image, Gamma compensation, and Interpolation settings. One awesome feature of this freeware is that you can use it as an BPG Converter too. Although, its conversion process is a bit time taking, still BPG images to other supported formats and vice versa are successfully converted. I will say, this is one good image viewer/editor that you can use to view BPG file image, edit it and convert it to other format when needed. XnView is one popular and advanced image viewer software that you can use as a BPG Viewer for free. This freeware not only lets you view BPG files but also edit them individually. It supports numerous viewing and editing tools that you can use on a BPG image and of course, you can save it to different formats as well. This freeware has an interactive interface which is full-fleged with various Menu options and shortcut for various viewing and editing tools. You can open a BPG image in it with Open option under File menu or simply drag and drop the file on the interface. Multiple BPG files can also be opened individually in multiple tabs, which you can easily toggle and view. If you want to view multiple BPG images simultaneously, you can do so with Window menu options: Cascade, Tile Horizontally, and Tile Vertically. As I mentioned, this free BPG Viewer supports numerous image viewing and editing options, which will let you Zoom, Rotate, Flip, and apply various editing effects and filters like; Reduce Red Eye, Blur, Enhance, Edge, Noise, etc. You can even capture screenshot of the window or a part of it with this freeware. Apart from viewing and editing BPG images, you can also use this freeware as a BPG Converter to batch convert multiple BPG images to its various supported formats. 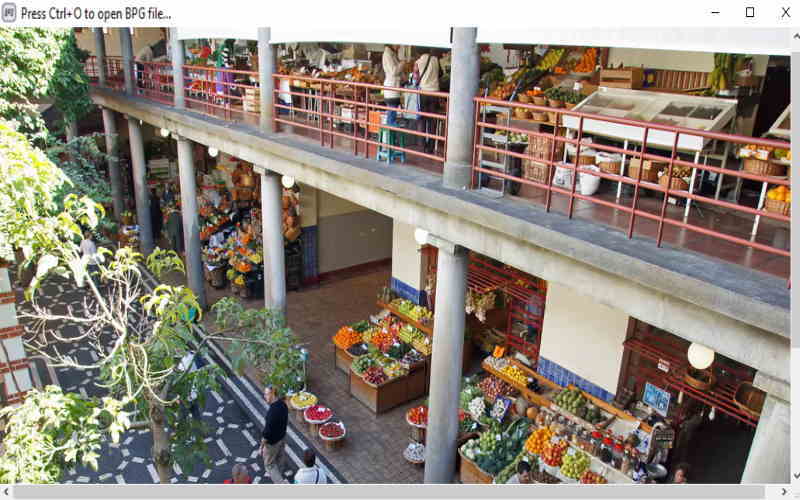 For me, this advanced free image Viewer proved to be a very successful BPG Viewer software. Not only I was able to view and edit my BPG file but also batch convert them to other supported formats. You too can opt for this advanced and free BPG Viewer for viewing, editing, and converting BPG files. 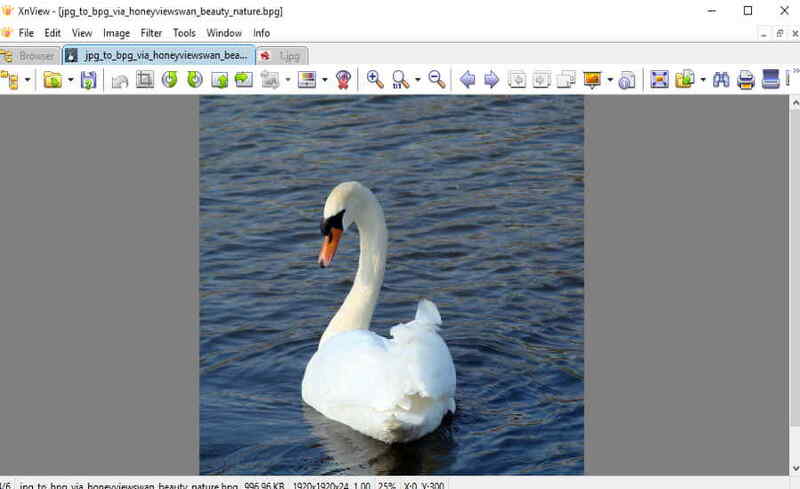 BPG Viewer is another simple BPG file viewer program, which you can use to view a BPG image. This is actually an .exe file from the developers of BPG format, which you have to download and extract on your PC in order to use it. Once you have extracted the folder, it will display the EXE file of the viewer program. You can run this EXE file from the command prompt or simply drag and drop the image on it. It will open up the image in a simple UI and you can view it from there. As this is a free and simple BPG Viewer program, I will say that you can use it to simply view a BPG file, in case you don’t have any other BPG Viewer software in your PC.